Hey, friends. How are you doing? You know that Halloween is coming and do you want to make any jewelry for the festival? If yes, you should never miss this project about how to make a pair of cool black spider earrings with glass and seed beads. Sounds fantastic, right? Then follow me to see the details below. 3rd, make a loop at the end of the eyepin then add the earring hook. 3rd, continue to add the beads onto the copper wire until the four pieces of wire are filled with black seed beads. Make another same earring pattern with the same steps. Look at the lively spider beaded earrings, how cool they are! Do you like them? Do not hesitate to make one pair for yourself if you are lack of such cool jewelry. Wear this pair of spider beads earrings will make you outstanding in the Halloween party. See you next time! Hello, guys. Do you need bling beaded earrings? How about glass beads hoop earrings? 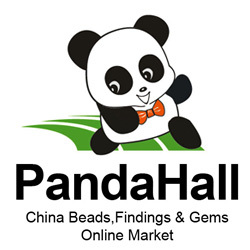 Then you can check this Pandahall free instruction on how to make glass beaded hoop earrings. Trust me, you will love it. Slide a pink drop glass bead onto a headpin, then cut off the extra pin and make a loop. Secondly, cut off another piece of copper wire and slide 10 4mm transparent glass beads, 3 6mm transparent glass beads and another 10 4mm transparent glass beads onto it, then twist the wires together. Fourthly, make another same hoop earring with the same steps. Then this pair of glass beads earrings has been finished! Look at this pair of glass beaded hoop earrings. Do you like the crystal beads earrings? You can finish them within three steps, so easy, right? Then what are you waiting for? Make a pair of beaded hoop earrings for yourself!